Creating a crocheted afghan doesn't have to take months to complete. 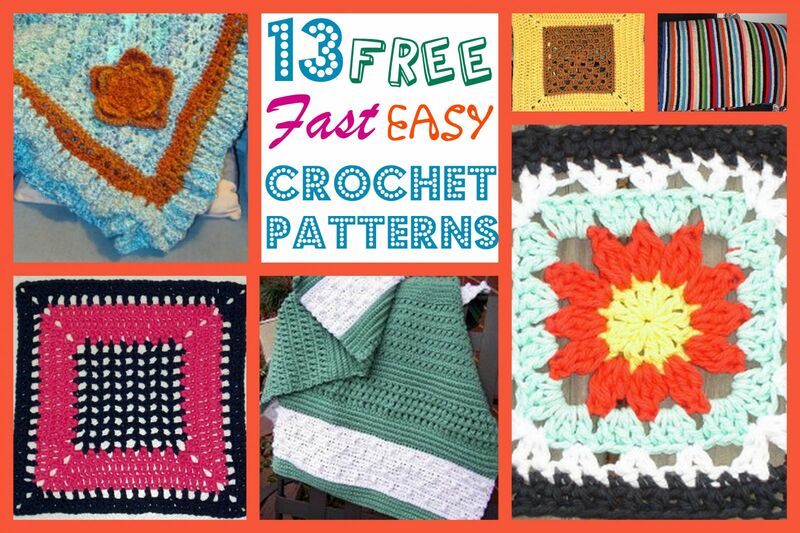 If you're short on time, take a look at these 13 Free, Fast, Easy Crochet Patterns to make. These free crochet patterns are easy to make and take very little time to complete. Making a crocheted afghan as a gift is always a nice gesture, but holidays and special occasions can sneak up on you! If you find yourself scrambling to make a homemade gift in a hurry, use this collection of 13 Free, Fast, Easy Crochet Patterns as your guide. From striped afghans, to easy granny square patterns, you'll find a great variety of free easy crochet patterns to choose from. Take a look below at some of our favorite fast and easy afghan crochet patterns. There are so many great choices, you won't know where to begin! Fast Easy and Pretty Afghan This free crochet afghan pattern uses bulky weight yarn. When you're short on time, bulky yarn is generally a great option because it produces only a few stitches per inch, which means you'll complete your project quickly. Textured Reversible Lap Blanket This lap blanket will be complete in no time because of its smaller size. Plus, it's reversible! Bev's Old Rainbow Blanket The only thing that would make this afghan better is if it came with a pot of gold! This gorgeous crochet pattern incorporates literally every color of the rainbow. Add a splash of color to any room with this afghan! Crochet Cozy Stripes Afghan This striped afghan is great for beginners and uses bulky yarn; you'll be done with it before you know it! Lovie Security Blanket Perfect for baby, this easy afghan pattern would make a great last-minute gift. Simple Turquoise and Orange Afghan Easy to make, and bright in color! Brighten up any room with this crocheted afghan. Textured Stripes Throw This is such an easy pattern; you'll want to make one for everyone you know! All of these easy crochet granny square patterns can be quickly joined together to create an easy crochet afghan. Pick one of these easy patterns and get started on your next easy afghan today! 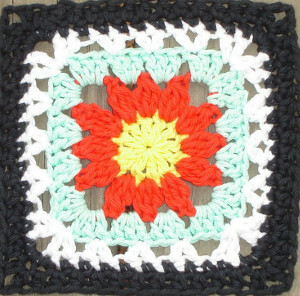 Bonnie's Flower Afghan Square You'll love the 3D effect of this granny square crochet pattern! Electrifying 12" Square Spice up your crocheting with this easy pattern. It's lightweight and bold at the same time - perfect for summer crocheting. Double Square Granny A square within another crochet square never looked so good! Bow Square This adorabe granny square pattern is complete with a yarn bow to finish the look. Julia's Crochet Flower Square This pretty flower crochet square will have you crocheting all summer long. Sweet Tea Granny Square Get a taste of both the traditional and the not-so-traditional with this granny square pattern.